Back in 2014 I started writing my friends’ CVs for them, to help them out during their job searches. Realising there was some demand for this service, I started offering freelance CV writing services to individuals alongside my day job. After four years (and much hard work) I now own a CV writing service and advice business which employs five people, gets over a hundred thousand visitors every month, and has written over five thousand CVs for happy customers. Transitioning from freelancer to business owner is a big challenge, but it’s something that I believe anyone can achieve with the right mindset and plan. In this post, I want to share my story to provide any aspiring entrepreneurs with some actionable tips on how to start and grow an online writing business. Before you start spending time and money launching a business, you need to ensure that there is sufficient demand for your service. You don’t want to pour your heart and soul into setting up a business, only to find out that there aren’t enough people out there who want what you are selling – I’ve done it with previous ventures, and it’s pretty soul-destroying. As a freelance CV writer, I knew there was some demand for my services because I was getting regular orders on freelance sites. This was obviously a good sign, but I needed some more confirmation before I made the leap. The best thing you can do to validate your business is find some competitors who are offering the same service. Lots of people worry when they see competing companies offering the same service that they intend to, because they fear it’s already been done, and there isn’t enough room for another business in the same space. But a healthy number of competitors is actually a great sign that your business idea could work. If there are already companies out there providing your services, it means that there is an active market of buyers out there who already want what you’re selling. From that point onward, I decided to start an online business selling CV writing services to job seekers, and it would be called StandOut CV. Once I had validated my idea, I needed a website for customers to find my business and make purchases through. I didn’t (and still don’t) have any web development experience, and didn’t have a lot of money to hire a developer, so I decided to use a DIY web shop builder. After much research and testing a few free-trials, I decided to go with Shopify, who I am still with today. Shopify is an excellent e-commerce platform because you can create a really good looking and functional website very simply, and it’s very well set up for creating content and ranking it in the search engines. It took some time and effort to learn how to use it properly, but it’s been critical to the success of my business. Related: When Do Freelance Writers Need to Think About Setting Up Their Own Website? I didn’t have any previous experience in building websites, so the next few months was a real learning curve for me. 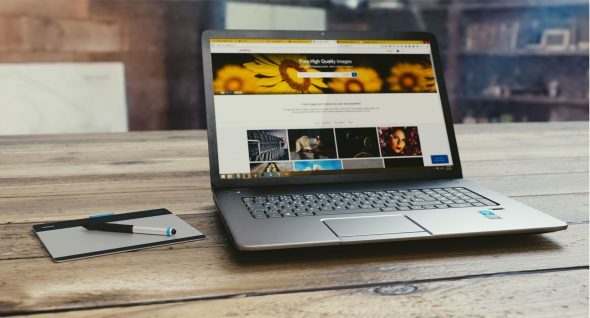 Luckily there are lots of free guides and resources online these days which can teach you how to set up your website properly in order to connect with your customers and make sales. These are some of the sites and resources I found helpful. The Hubspot blog – absolutely huge digital marketing advice site with lots of free resources you can download including proposal templates and social image templates. I initially got the website up within a few months and started running ads to generate traffic to it. But in all honesty, the website wasn’t up to a decent standard until about one year later because you make mistakes when you first start. If you’re going to start your own online business, the one thing you really need to be prepared to do is learn. I spent hours every day learning about web design, conversion optimisation and overall online marketing strategy, and I still do today. You’ll definitely make mistakes when you first start out, but if you keep learning, and keep increasing your knowledge of digital marketing, you’ll constantly improve your site and your business. Once I had my site up and running, like most online business newbies, I expected the customers would come flooding in right away. But they didn’t and the site was rendered useless. With any online business, you need a plan for driving potential customers to your website, or you have no chance of making any sales. There are tons of ways to generate targeted traffic to your website, but I’m just going to talk about the one that’s worked best for me; and that’s SEO or search engine optimisation. The reason I would recommend SEO to anyone starting an online writing business is because if you do it yourself, it’s free, and it mainly requires the writing skills you already have. I’m not going to cover every aspect of SEO in this post, but I will stress that it’s not as technical as most people think. It’s actually more about writing good content on your site, and building relationships with other websites in your niche to promote that content. These are the two main tactics which I’ve used to rank for competitive keywords in the CV writing niche, and generate over a million organic visitors to date. The first step in generating traffic via SEO is to add content to your site that will be helpful to your potential customers. And if you want to outrank your competition, you need to make your content ten times better than theirs. For example, I created this list post of ten example CVs and this 6,000-word guide on how to write a CV. These are the most detailed and in-depth guides you will find on their subjects, and my visitors frequently email me to tell me how helpful they’ve found them. Google want to provide search users with pages that answer their search queries thoroughly. So, if you create blog posts that thoroughly answer those questions, Google will start to show your pages in the search results over time. One of Google’s many ranking factors which determine where your site will appear in the search results is links from other sites to your own. Having reputable websites linking to your website shows Google that you are a trusted source of information. So, the more quality links you have pointing your site, the more likely Google is to bump you up in the rankings for your desired keywords. One of the most straight-forward (and free) ways of gaining good backlinks is by contributing articles to well-known websites in your niche, who will accredit you with an author bio which includes a link to your website. Being in the employment niche, I reached out to job websites, career blogs, and graduate advice sites, and offered them guest careers advice posts. At first, I got a lot of rejections or was just ignored – but over time I perfected my pitch and started to build up a portfolio of guest posts I could use to prove my writing abilities. Over the years I’ve been lucky enough to land guest posts with some pretty big sites, such as Fast Company, The Guardian and CV Library . It’s been a lot of hard work and I’ve probably written over a hundred guest posts, but the benefits to my SEO efforts have been crucial in driving organic and referral traffic to my site. If you want to learn more about SEO, I would highly recommend Brian Dean’s blog Backlinko – he’s regarded as one of the best SEO’s in the world and has some incredible actionable guides you can read. Ask anybody who runs a business and they will tell you that one of biggest challenges is finding good people. As a freelancer, it’s tempting to want total control over the delivery of all of your work, but if you want to grow, you need to hire good people and trust them with your clients. This will then give you the time you need to focus on growing your business while most of the day-to-day work is being looked after. I needed to find good writers to write CVs for my customers, and also to write content for my site. As a former freelancer, I knew exactly where to find them – on the sites where I had previously offered services. Having experience as a freelancer gives you a huge advantage in finding good freelancers because you know exactly what freelancers are looking for. Provide a detailed brief – As you probably know, good writers are reluctant to work to poor briefs, and they often lead to a poor finished product. Be clear on what you are looking for and specify every detail including audience, tone, structure and word count. 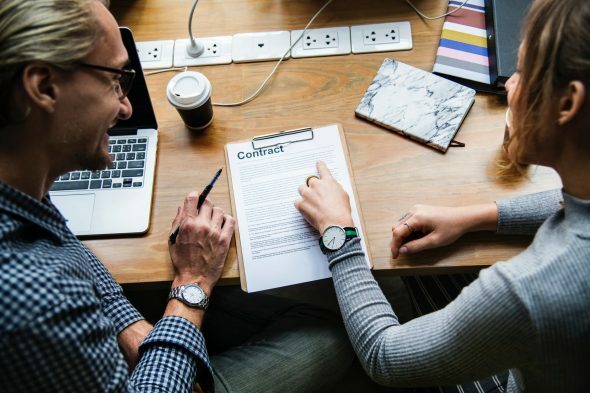 Pay fairly – You don’t have to blow all of your budget and kill your profit margins, but you have to pay market rate if you want to hire experienced writers. If you are asking a lot, but paying a little, nobody will want to work for you. I found that posting a job on one of the major freelance sites with a detailed brief and a decent level of pay would attract a good number of responses. From there I would create a shortlist of around five people and test them with a basic article or CV writing job to get a feel for their abilities. Unfortunately, you will hire people who don’t work out for you, and that will cost you money, but it’s just part of the process. Just make sure that you have an editing process in place to check work before it goes out to clients or on to your site – and hold on to the good people when you find them. 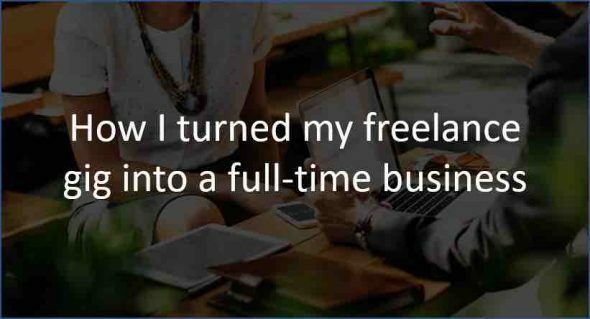 Transitioning from freelancer to business owner is a daunting prospect, but it’s very achievable with all of the tools and resources available to us today. 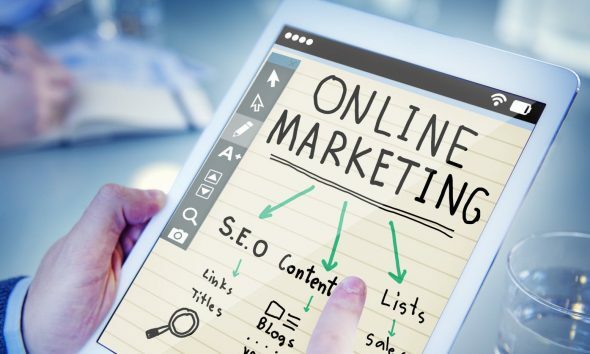 It’s relatively cheap and easy to get a website set up, and driving the right customers to your store through SEO just requires learning, determination and persistence. And there’s no need to throw all your eggs in one basket and quit your job to start a business, you can work it on the side whilst you work and/or freelance, and only make the jump to go full time when you’re ready. Hopefully, this post has given you some actions you can take to start your own business. If you’re thinking about giving it shot, I’d say go for it – you never know where it might take you. This post was written by Andrew Fennell. He is the founder and director of London based CV writing service StandOut CV, he is also a regular contributor to a number of websites including Fast Company, The Guardian and CV Library. Great in-depth article! Here’s my question: as a full-time professional freelancer, I have never listened to folks who told me “if you have more work than you can handle you should hire writers to work for you.” Reason being: I want to be a writer, not a manager of writers. Of course, CV writing is a very different business from what I think of as “writing” (researching and crafting articles and books, for the most part) — but don’t you miss actually WRITING as opposed to managing staff and making sales? Thanks, Andrew. A very motivating article. I have recently quit my job to become a full-time freelance content writer and provider of content writing services, among other things. So much of what you have said, I have gone through myself. I worked as a part-time freelancer for eight years before I made the plunge. I had enough work at hand to keep me occupied with assurances of much more if I went into it full-time. I am into my fifth month, and I already have so much work that I had to hire a few other freelancers to help me out. And they love the work. We are a good team. But like you said, firstly, we need to be sure that there is enough demand for what we have to offer. Secondly, we need to upskill by learning as we go along, as you mentioned about learning how to create a website, do SEO, and so much more. Great post, Andrew! I’ve been freelancing off and on, part-time and full-time, since 2008. Now that I’m out of college and my kids are a bit older, I’m ready to go from freelance to LLC. This post came at a good time and highlights all the same things I’m currently working on (except the hiring out, which is on the growth plan if it’s needed later). I also intend to hire good freelancers from the sites I work from and agree being a freelancer helps both with finding good workers and being a fair client. It’s definitely a challenge. One has to be prepared to juggle the “other” work, like the bookkeeping and website/blog/social media admin, alongside their main body of work. Unless those tasks can be hired out (let’s face it – some of us can’t afford it at first), the onus is on the business owner to see they’re done. But, with grit and hard graft, it can be managed. Congrats on your success…may it continue!